Pro-GrowTM user-friendly Gro-Control Heating Thermostats are designed to withstand heavy use in the greenhouse environment with a heavy-duty steel enclosed capillary tube design, baked enamel finish, and specially selected internal components for longevity. 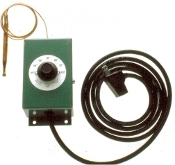 Thermostat control range 40-100 degrees F with dial adjustment. They are designed to control soil temperature to within 1 degree F of thermostat setting to insure optimum seed germination and uniform plant growth. *For convenient mounting, all Control Heating Thermostats are designed with 2 screw mounts on top and 2 screw mounts on bottom (no extra mounting bracket is required for purchase). 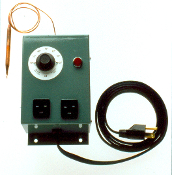 All Gro-Control Heating Thermostats can be used with all models of Pro-Grow's Propagation Mats sold separately. Do not operate Pro-Grow Propagation Mats without a Pro-Grow Gro-Control Heating Control Thermostat. Click on the pictures below for more details...and welcome to Pro-Grow's line of durable Control Thermostats! Heavy-Duty Control Thermostats are designed for use with Pro-GrowTM Heavy-Duty Propagating Mats (mats sold separately) and we do not recommend operating mats without one. Manufactured in USA. Content copyright 2012. Durable Greenhouse & Nursery Equipment LLC. All rights reserved.